FinnFest USA '99 Winter Raffle winners selected at Annual Meeting on April 18th! No longer "coming soon!" Not "just around the corner." 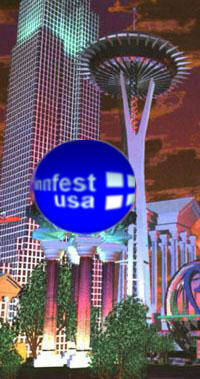 FinnFest USA 1999 in Seattle is finally here! Have you sent in your registration yet? Have you invited your friends to come along? Now is the time. The festival program looks very exciting! See the Weekend Special! Great for people who cannot come for the whole festival. Welcome to Seattle and the Pacific Northwest! The Pacific Northwest Finnish community extends its heartiest welcome to all Finns and all friends of Finnish culture to this summer's FinnFest USA '99. Join us for a celebration of "Finnishness" in the prime of Seattles summer as Finns from around the world gather. The festival is being held in Seattle, WA, on the beautiful University of Washington campus. Nestled between Lake Washington and the Puget Sound, with Mt. Rainier as a majestic back drop, the surroundings are sure to provide for a memorable FinnFest that will be talked about for years to come. The festival dates are July 22-25, 1999. Sunny warm days are just about as certain as is rain in mid-winter. The flowers are in bloom, and "the Mountain is out" as we say. Plan to come early as some exciting programs will start on Wednesday, July 21. Some highlights of Wednesday's programs are the genealogical lectures in the afternoon and a special evening concert: The Roots and Wings of the Finnish Tango. The concert is free to FinnFest registrants. 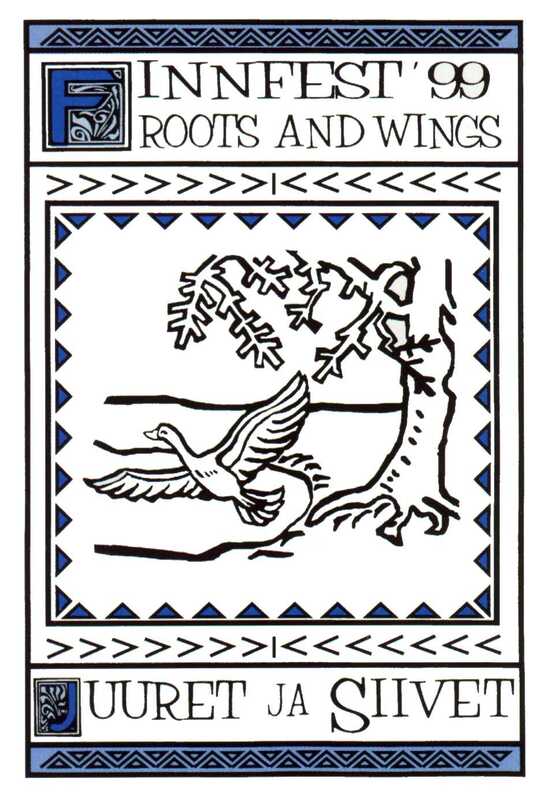 What better way to start a FinnFest with the theme: Roots and Wings! You may also wish to take part in the many exciting excursions to view the attractions of Seattle and its environs, or to catch a boat to Alaska or British Columbia. The tours are a wonderful way for the Finnish visitors to experience the beauty and the varied scenery of the Pacific Northwest. The planners of the festival want to offer information and entertainment on both the Finnish heritage, our Roots, and the latest Finnish accomplishments in arts, music, sports and technology, our Wings. 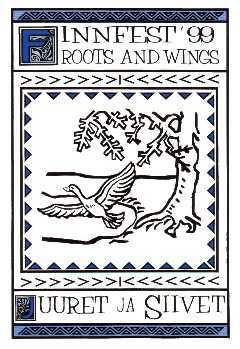 The highlights of the Roots include a very comprehensive series of lectures and workshops on genealogy, and a wide array of programs on Kalevala to celebrate the 150th anniversary of the national epic. Attractions of today's Finland include its many technological achievements, the most dazzling of Finnish fashions, and the latest Finnish sports. The Finnish visitors can show the other FinnFest visitors and local Seattleites how to play floorball, a game not yet well known in the United States. FinnFest USA '99 is an event for participants of all ages. Many of the programs will appeal to all generations. There will be a lot of programs for children of all ages, starting with the toddlers. Children's Shows, storytellers, Finnish crafts, Finnish music and young entertainers are bound to entertain children and parents alike. Young adults will have special gatherings and activities for their age group including a Thursday evening picnic and a Saturday evening cruise on Lake Washington. The hosts include the students of the Finnish language at the University of Washington. FinnFest entertainment appeals to Finns and local Seattleites alike. The highlight of the program will be a concert of Finnish music performed by members of the Seattle Symphony and conducted by one of the famous young Finnish conductors, Hannu Lintu. The program will also feature the Finnish Concertmaster of the Seattle Symphony, Ilkka Talvi. You will enjoy. You will be proud. On the lighter side you will be able to dance the Finnish tango to the tunes of Petri Ikkela's band. He is bringing with him the ultimate Finnish soloists: Arja Koriseva, the all time favorite Tango Queen, and Kari Piironen, voted the best tango singer in Finland. We are greatly honored to have Mrs. Elisabeth Rehn as a guest celebrity speaker at FinnFest. She is well-known in Finland and all over the world. She has a long and prominent political career in Finland, the European Union and most recently, the United Nations where she is serving as Special Representative of Secretary General in Bosnia. She served as Finland’s Minister of Defense from 1990-95, and came in second in close elections for the Finnish Presidency in 1994. She is also the leading candidate for the next presidency in current polls. Come and hear Veikka Gustafson, the Finnish mountain climber who climbed two previously unnamed peaks in Antarctica and now one of these mountains is named: Mt. Sisu! FinnFest’s world premier Kalevala-based play The Sampo has become a musical - rumor has it there is even a tango in it. It will be a great way for both children and adults to get acquainted with the leading story of the Kalevala. The three performances are free to FinnFest registrants. Fashion Show Luncheon is sold out!! You can still see the fashions by purchasing a Gallery Ticket that lets you see the fashions and participate in the sale afterwards. Gallery tickets are only $10 for registrants. Saturday’s Youth Cruise is now available for all FinnFest registrants young at heart. The entertainment will be geared to young adults. Tickets for all ages $20. All Ticketed Events are going fast, so do not delay! Thursday’s Taste of Ballard Tour is sold out, but some places remain for the tours on Wednesday. Sointula Trip has been designed and priced resulting in a great tour of Finnish history and the best of Pacific Northwest scenery, all at a reasonable price. See the details on FinnFest’s Web site at www.finns.org. Tour number 11, Boeing Plant is sold out. So are hotels University Inn and Mayflower Park. FinnFest is indeed here. We hope to see you there! Opportunity to purchase a ticket to the Friday Barbecue. Opportunity to purchase a registrant ticket at only $22 to the Friday evening Symphony Concert. Free attendance at Friday evening showing of The Sampo musical. Friday evening dance to the tunes of Oren Tikkanen and his Keskilännen Pelimannit and Seattle’s own Northwest Pelimannit. FinnFest USA '99 is still accepting walk-up registrations through 12:00PM noon, on Saturday, July 24! Take advantage of our single-day registrations! Call, e-mail or Fax ahead for information. Remind your friends, children and grandchildren to do the same. Meanwhile, please keep checking the Web Site at www.finns.org for the latest FinnFest information. Tervetuloa Seattleen! We are looking forward to seeing you there!!! This site is supported soley by our sponsors. Check them out and thank them for their support! Feel free to contact us with any questions you may have that aren't answered within this web site. Finnair is an "Eagle" Sponsor of FinnFest USA '99. Visit our other Corporate and Private Sponsors. Thanks!